The beautiful shoreline and piney woods should be enough to attract you to camp at Lake Livingston State Park. If it isn't, how about camping with a trained park ranger where all the gear is provided? Bring your food and family and we'll see you there! 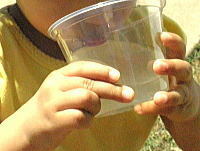 Lemonade Day is a city-wide event where kids set up their own lemonade stands and sell lemonade to the community. Kids get to keep what they earn. Through this experience, children of all ages learn the value of setting goals, developing a business plan, establishing a budget, seeking investors, providing customer service, and giving back to their community. ----Kids get a Lemonade Day Backpack that includes a fun and instructive Entrepreneur's Workbook. ----Then, each kid sets up their lemonade stand at the time and location of their choice and sells lemonade to the community. The College Station ISD art teachers will host the annual district art show . All CSISD campuses will be represented at the show by hundreds of works of art in multiple mediums. St. Francis Episcopal Church is proud to host this community concert series, featuring talented local musicians. Everyone is invited to attend! Free admission, donations gratefully accepted. There is a suggested donation of $10 per person, but we welcome and appreciate donations of any amount. Load up your coolers, blankets and lawn chairs for free entertainment. Admission is free, gates open at 6 p.m. and the concerts begin at 7 p.m. Guests may bring their own refreshments, but coolers must be 48 quarts or smaller and glass containers are not allowed. Refreshments and souvenir shirts will be on sale. Parking is available at Post Oak Mall, and handicap parking will be located off of Colgate Drive. The Local is a weekly neighborhood artisan market where local and regional makers and farmers come together to showcase and sell their products to the community. The market features vendors, food trucks and music. Enjoy a Variety of historical and cultural experiences for every family member. The Sam Houston Memorial Museum's 15 acre grounds will be transformed from a peaceful setting into a bustling frontier settlement where you can watch educational reenactments, listen to music, shop for crafts, wares, and food, or simpley stroll the same grounds where Sam and Margaret Houston lived and where their children played. This annual event features a Saturday parade, live entertainment, a children's area and the world's largest strawberry shortcake, a mud volleyball tournament, beauty pageant, barbecue cook-off, contests and wine tasting. You can buy certain ENERGY STAR energy-efficient products tax-free during the annual Texas ENERGY STAR Sales Tax Holiday. There is no limit on the number of qualifying items you can buy, and you do not need to give the seller an exemption certificate to buy items tax free. Bring your blankets and lawn chairs as we enjoy this film under the stars by the presidential pond. Games and free refreshments will begin at 7 p.m., and the movie will start after sundown. In celebration of Mother's Day, read about becoming an expert grandma sitter in How to Babysit a Grandma followed by Mom School. In Mom School a little girl imagines where her mom picked up all her amazing skills, like fixing a bike tire and baking cupcakes. Join us afterward to make a card for your mom or special caregiver. Bryan Animal Center will be there giving away 100 free microchips to Brazos County residents, Chasing Tails Mobile Veterinary Services will be there with low cost vaccinations, and BCS Air Solutions, LLC will be sponsoring all adoptions for the day! Bring your furry friend and your family to Morris "Buzz" Hamilton Dog Park for food, fun, and fur! Traditional Greek foods and gift items, live music, and folk dance performances. Join us at Market on the Green on Sunday, May 20th, from 10 am to 2 pm for a special event - Mommy Son Dig Day! 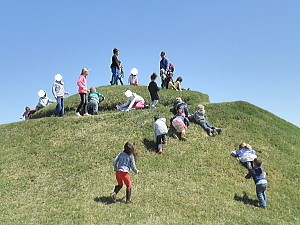 Celebrate all mothers and let the kids play in the sand and climb Mount Millican. Enjoy live music from Asa Harris and a sweet or savory lunch from Fire Truck Crepes as you shop for fresh produce and handcrafted goods from local farmers and artisans. Savor the Sunday spring sunshine with your family! We have 22 rows of approximately 8 acres of Southern Highbush and Rabbiteye blueberries . Our farm is only opened during the season when the blueberries are ripe (usually late May through Mid July). We provide buckets to pick your blueberries and plastic bags to take them home with you. Bring your blankets, chairs and coolers to experience our Movies in the Park series on our 32-foot inflatable high definition screen. Admission is free and gates will open one hour prior to the movie start time. Guests may bring their own refreshments. Coolers must be 48 quarts or smaller. Alcohol and glass containers are not allowed. Concessions will be available for purchase. Pets are welcome, too!